David’s least favorites were red and green; and his favorites were white and blue, with the blue team winning with their crispy lamb and artichokes three ways. Each player won $5K, and there would be no immunity this week. For the elimination challenge, each team as they were constructed would go to a hot NYC restaurant, dine there, and then work against each other to create a meal that would represent the kitchen of that restaurant. The green team got Ma Peche, which was Chang’s restaurant; Red got Townhouse; the blue team Marea; and white team WD-50. They would compete against each other and there would be one winner per team, and one overall winner. There would be four losers, one from each team, with TWO of them going home. Yikes. This was an interesting and apparently very difficult challenge. 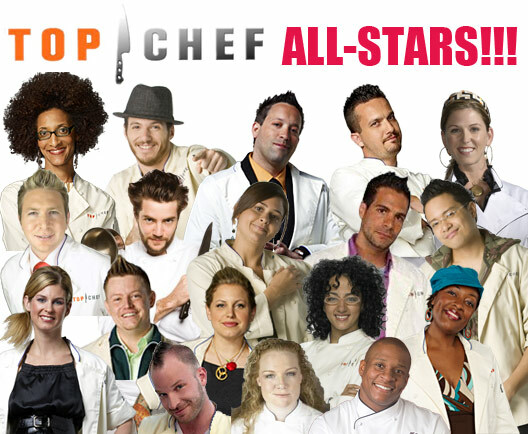 The judges would be the chefs from each of the restaurants and also included Kate Krader from Food & Wine Magazine. The winners were Dale T (sunnyside up egg dumpling with pork belly), Antonia (pea and carrot purees with seared scallop), Angelo (turmeric marinated fish with salmon roe and white chocolate) and Tre (grilled swordfish with braised artichoke). The favorite dish was Dale, based on Wylie Dufresne’s WD-50. The losers were Stephen (salmon with figs, broccoli and fennel pollen), Tiffani (broken summer heirloom melon with powdered ham and cheese), Fabio (roasted lamb with hoisin bbq sauce and homemade ricotta) and Dale L (roasted veal loin with peanuts and popcorn). The two going home…..Stephen and Dale L. Fabio dodged a bullet, and I was kind of surprised Dale went home before he did.